WHY CAN'T SPANISH DOGS LEARN ENGLISH? Well, we all know the famous saying, 'it never rains but it pours', perhaps it should be 'paws' instead!! This morning I went outside to clean up a wound one of our cats has, probably from a big cat fight the other day. Whilst cleaning I realised how nasty it was, and he has a big infection. So I bit the bullet and trundled him to the vet. After about an hour we emerged, cleaned up, antibiotics, anti-inflammatory and bandaged. I have to play vet to him for the next week probably, cleaning and re-bandaging the wound twice a day at first, then every other day. So Adolf, as he is known because of his little black moustache, is staying first class in our small bathroom with his own bed and loo etc. Good job I'm not working full time at the moment. Anyway, I am sure he'll be fine now. Update on Rufferty Roo (our boxer), his ears are improving already, after just two days of drops, which is great news. So what with the dog, the cat and the turkey, I am hoping that's it for a while! no more animal sickness please, I need to look after some humans too!! I managed to pick up some gas bottles this morning (we don't have piped gas to this part of the island), but only just before they closed, as C is trying to make marmalade and it uses a lot of gas on the hob! 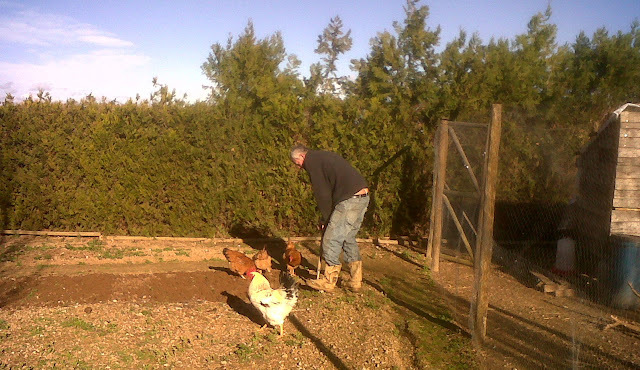 The other day, C was in the vegetable plot turning over some of the beds and getting rid of some weeds, which grow like crazy here. 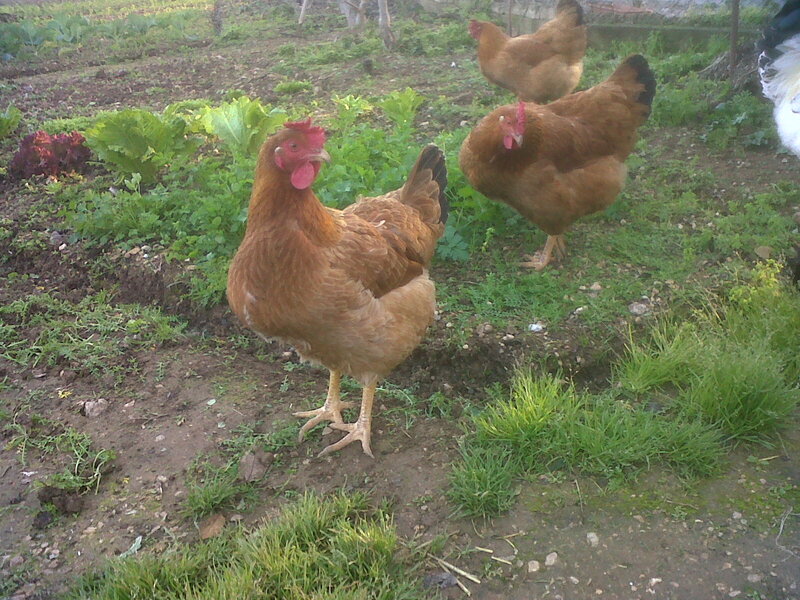 He let the chickens out and they followed him about picking up insects and big juicy worms - lovely for them. 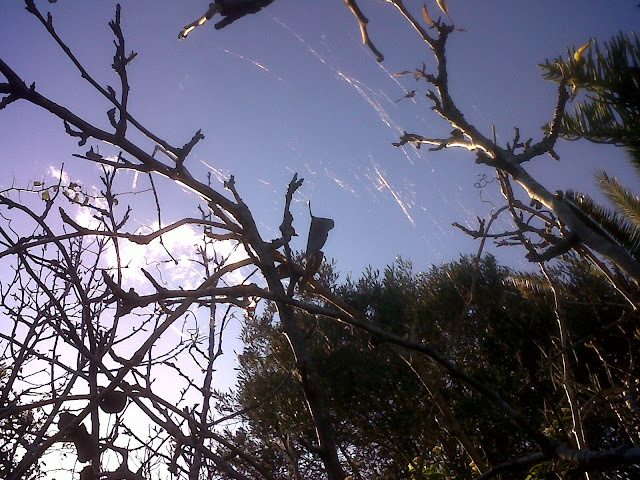 Whilst pruning one of the pear trees, that had been completely overgrown with a climbing plant, I discovered some very strong spider web strands, perhaps they were made by another insect/animal but these were so tough and sticky they were difficult to break and pull off the tree. The chickens are enjoying their weekly treat of foraging in the vegetable plot, however, the cockerel is getting a taste for cabbage leaves, so we have to be on guard, I need to build something to keep them off! 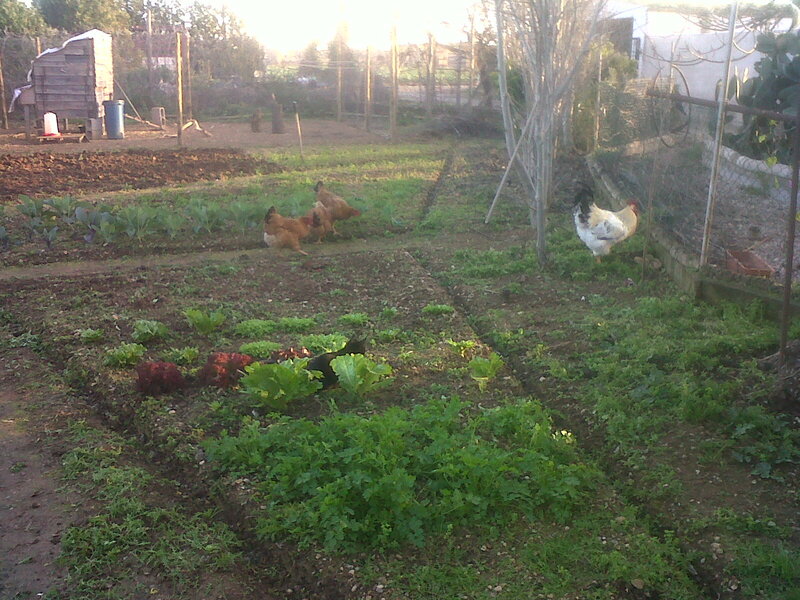 The girls going through the parsley & lettuce! 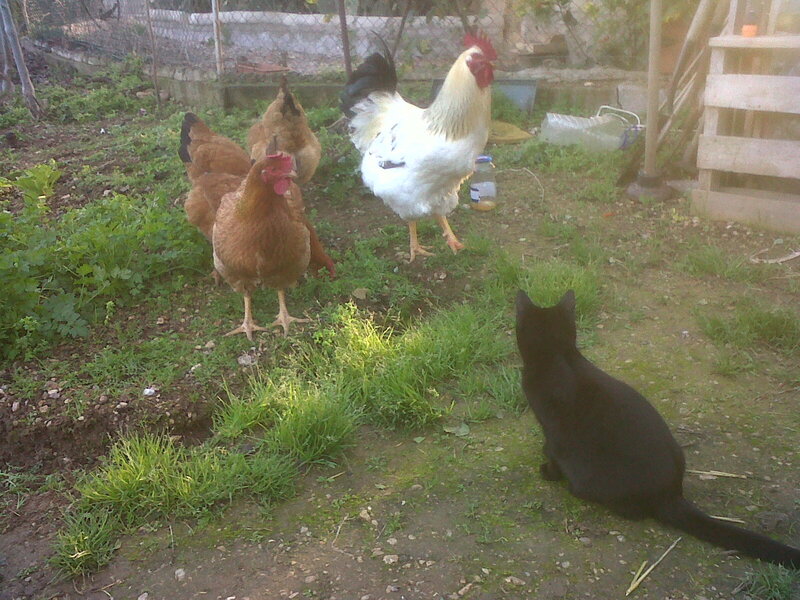 Samuel Sprat sizing up the cockerel! Private Supper Club Mallorca "Sa Llebre"
All photos & writings belong to the author & should not be used without prior permission. Watermark theme. Powered by Blogger.